Indian Bus Market on the Growing Spree! Indian road network is the 2nd highest in the world, which transports more than 60% of the goods from one place to other and 90% of India’s total passenger traffic. With the increasing improvement in connectivity between cities, towns and villages in the country and the requirement of people for easy mobility, road transportation has gradually improved. Among all the automotives, India always had a huge potential for Bus segment. As it is one of the vital integral segments of Indian automobile industry. It is a common widespread public transport. The industry comprises of buses that are categorized into school buses, mini buses, tourist buses, deluxe buses, commuter buses and others depending on the use. In the last fiscal (FY2016-17) Indian Bus Industry grew at 5.70% with 98,137 units against FY2015-16. The industry in FY2016-17 grew on the back of demand of State Transport Undertakings (STUs) & City Bus Undertakings (CBUs). A big surge in STU orders after a gap of 4 years was witnessed, indicating renewed focus of various state governments and city councils on public transport. With the increasing demand of convenient mobility and the motto of aggressive innovation in India, government has taken very aggressive decisions on the infrastructure & on the regulations such as max speed of 150 Km/hr on the Delhi corridor, prepone implementation of Bharat Stage (BS)-VI emission standards by a year, to April 2020, AC fitment etc. While taking one step ahead, government has decided to implement bus body code AIS: 052, which will ensure that buses are built as per stipulated standards related to safety, design and comfort. 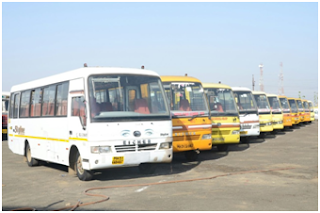 To demonstrate their capabilities to build buses as per the safety standards set by ARAI, CIRT and ICAT, every bus manufacturing unit will have to obtain accreditation certificate according to this code. Also, now bus industry is on the spree of bringing electric buses to the market, helping government to meet its goal of making Indian Automotive Segment completely electric by 2030. Many manufacturers have already started their trials for the same. With traditional CV manufacturers looking at increasing their reach into international markets, Indian bus market is expected to grow at a CAGR of 10% by 2020. With new commercial vehicle industry rising, we can witness the robust growth of used commercial vehicle industry as well. Shriram Automall India Limited (SAMIL) is the leading name to acquire best pre-owned commercial vehicles of every make and model in India. So, what are you waiting for? Visit your nearby Automall today or click the link below to register yourself.